The Industry today continues to look to improved performance across a wide range of thermal systems. Fives is well positioned to address the needs with an emphasis on improved heat distribution and efficiency. The Chemical industry today is focused on improving performance across a wide range of thermal systems spanning process heaters, thermal oxidizers, calcining furnaces (Flash, Direct and Indirect), Hot Gas Generators and Dryers. 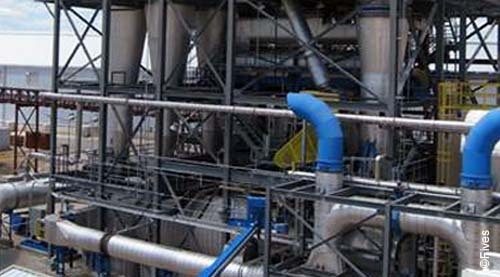 Fives brings its expertise and services to supply tailor-made solutions and ensure an optimal performance of the plant. Fives offers combustion systems of using various high technologies to ensure low NOx and CO emissions and low fuel consumption. Fives designs tailor-made solutions to dry raw materials and improve the thermal efficiency of the installation. Fives packages Hot gas generation assemblies and fuel trains per AINSI specs. Fives brings a full range of ancillaries systems such as blowers, atomizers, valves, and regulators. To ensure performance and high availability all along the process and life cycle, Fives develops hard wired logic and run-safe solutions Safety using certified PLC-based logic systems.